09/23/2013 09/23/2013 nathanrushton35 Comments on Update:Halloween October 1st! Hello everyone and there was just an update which seems to tell us that the Simpsons Halloween update will be October 1st with the season premier episode tie-in this week! More news on that later! Update:Hello everyone and there was just a small update on tapped out and it involves Homer and Lisa talking about the upcoming event of Halloween. The season premier episode tie-in appears to arrive this week and the Halloween update should be arriving October 1st. Now I will have Lisa and Homers little quest coming up soon but for now here is the image of the confirmation of Halloween coming October 1st. No character has to be free as after the update they will start the quest automatically. The quest involves a four hour task for Lisa! Thanks again and the little chat between Lisa and Homer will be posted soon. Hey Jarrod! – We do not have an exact time. The information we are all going on came from the prelude to the Season 25 premier update dialogue that came a few days ago. 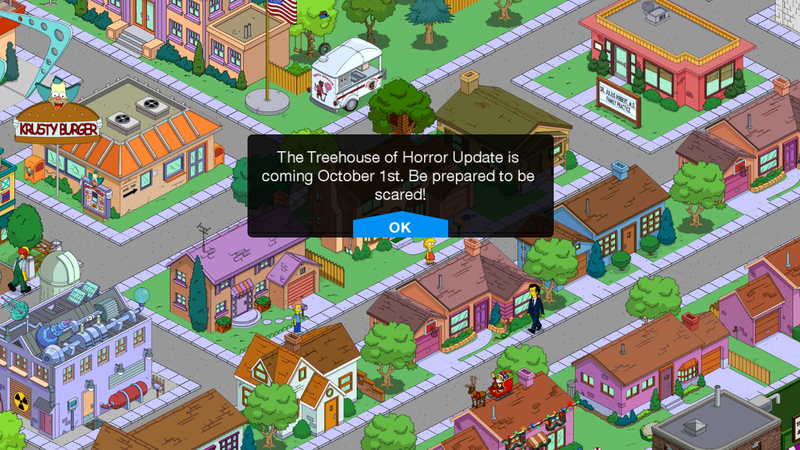 The prompt in the game said that the Treehouse of Horror event will begin on October 1. No time was given and we’re all just assuming based on past events. It’s almost 11 am where I’m at and my updates have between between 9am-12 or 1pm. So hopefully it will arrive within the next few hours. Unless EA is playing a cruel joke on their entire consumer base. How much money would you guys recommend having saved up for the Halloween update? Or do you think everything will be bought with another type of currency? Last year it was candy. You earned it instead of cash on some things. But there was regular content released with the update as well and some of the regular and Halloween content was premium. Who knows what it will be this year but I’d stock up on cash and donuts. I saw something about a glowing Mayan thing that this guy unlocked early: http://5000tappedout.tumblr.com Seems like cool things will happen in the new update 🙂 🙂 excited!! I had two in game updates. The original one was 204 mb I think which prompted Lisa’s 4 hour task and now I just got on again with a 150 mb update. Anyone else have this too? Sooooooooo Excited….. can hardly wait! I believe that the update was done too quickly and should have had more time spent on it. This is because there is a new glitch I’ve experienced today which is that playable or non playable(krustyland people) will change what they look like. For example I saw Lisa walking while she changed into the top half of Flanders, Patty and Grandpa. Their really wasn’t any update, just an addition. It didn’t contain any fixes or serious content changes. That is also known as a texture glitch although since it’s a character I’d imagine we’d have to call it something else. They’re very common and really have nothing to do with updates. I’m dead set on it is caused by individual device processors but i’m not tech savvy enough to prove it. I got the update and was so scared. I wanted to be done with the most recent level first so I can concentrate on it. Gives me time before my vacay =). I get to come back to the Halloween update. Yay! I want to store Lisa so I can start this but she’s doing an outside task so i can’t store her! Store the Simpson’s house, that might work? Sorry hoader, can’t store that! I don’t think you can store the Simpson House. Thanks for the update. I best not have anyone do any tasks on the first. Won’t be able to do this task till the morning since I have everyone on a 24 hours task sine this morning. Oh and the “small update” you talk about. Well I think 50mb update is pretty big for this game. Mine is a 50mb update, is that the same for everyone? I’m not sure I’d call that small ! Sooo exited guys can’t wait!!! I might be being really dense, but when does it confirm an episode tie in this week? They might just assume that since halloween is a big un’ they don’t need to give us two in such a short space. Lisa and Homer where talking about it and Lisa said there will be a small update before the event for the season 25 episode tie-in and that calculates to this week! When will the episode premeire? Previous When Life Gives You Lemons, the famous Springfield Lemon Tree!